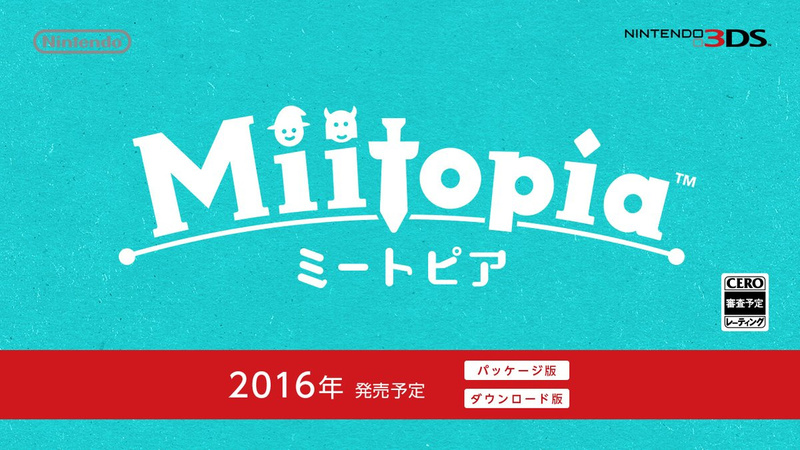 A while back Nintendo confirmed that it was making a Mii-based title for the 3DS known as Miitopia, but stopped short of giving any other details aside from the title and "2016" release window. The lack of information regarding this game has led some to assume it has been pushed into 2017, but Nintendo has confirmed that it is indeed still on course for a release this year - in Japan, at least. During the company's recent financial briefing, Nintendo CEO Tatsumi Kimishima stated that Miitopia is one of 2016's big holiday releases in the region, and that more information will be released "at a later date". The game's logo features a sword, which hints at some kind of fantasy RPG setting - perhaps this will be like an expanded version of StreetPass Quest, where you recruit other Miis to help you on an epic adventure? Let us know what you think Miitopia will shape up like by posting a comment below. I hope it's more of an action RPG. Still, more games the better. Hopefully it's good and gets localised. Is it gonna be the ultimate Mii game?? The name Miitopia says it is!! Hm... need a date release. I am still flabbergasted Nintendo spend their exteremely tight resources on games like this and Fed Farce, when fans clearly want proper updates on their other beloved franchises. @GravyThief Now is when I remind you that Tomodachi Life moved around 3.12 million units. @MarcelRguez I just think games like this and T life would sit better in Nintendo's new smartphone efforts, where they would likely sell much more than 3m and generate much more revenue. And not eat into their 'proper game' resources. I can't argue with those sales figures, but whilst we get cr*p like Fed Farce, Amiibo Crossing and weird Mii games, I'll remain bitter! NICE! This'll like be set on Wuhu Island, as Miyamoto has stated he wanted to make it an iconic location for all types of games. Ever since I read that comment I've been wanting to see this idea be put to use. I love Wuhu Island and the Miis, so I'm really hoping this'll turn into something great! It said from Katakana letters 'Package' and 'Download'. Could it be Miitopia will be released on both Physical and Digital Download ? I LOVE weird Mii games. I still can't believe how much I enjoyed Tomodachi Life, so I'm looking forward to this! @GravyThief How do you know for sure a game like this is eating into their resources for "proper games" ? It's actually over 5 million copies now.